To create the menu, we will use the online tool - Drop Down Menu Generator. The main advantage of the Menu Generator is that it does everything automatically, quickly, easily and gives out the professional menu which does not require additional customization. For more details about the Menu Generator, please read the post: Unusual menu editor - Drop Down Menu Generator. Under the Structure Tab, define menu elements: Links, Headers, Separators and Images. The Structure Editor is based on drag-and-drop functionality. 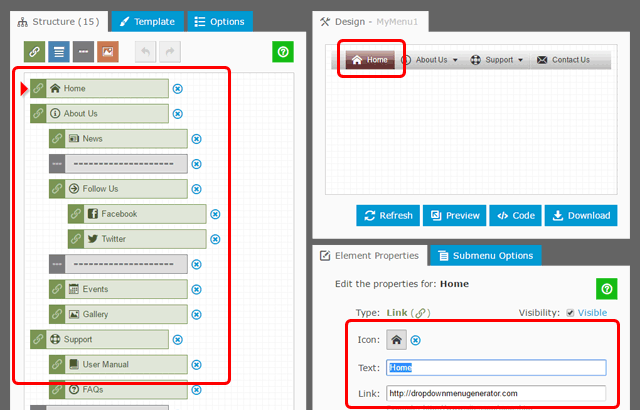 It enables you to easily create a menu structure displaying multiple levels of hierarchy. For each Link Element, set the Text and the Link (URL) of the page. To make your menu more user-friendly, add the icons. Menu Generator includes general icons (Home, Help, E-mail, etc. ), icons for social networking (Facebook, Twitter, etc. ), multi-purpose icons (arrows, dots, etc.) and others. In the Menu Generator, choose a suitable template for your menu, adjust the colors and the font in accordance with the style of your website. Under the Additional Options Tab, set the width to 100% and center alignment. Now your menu is completed; save it to the local disk as "MyMenu1.zip" file by clicking on the Download button. By default, the "MyMenu1" is a name of the menu. Launch Yahoo SiteBuilder, open your website from the "C:\MySite" and ensure that the "MyMenu1" folder is a part of your site. If you do not see the "MyMenu1" folder in the "Site Contents" window, please right click on the blank area, and choose "Refresh File List". 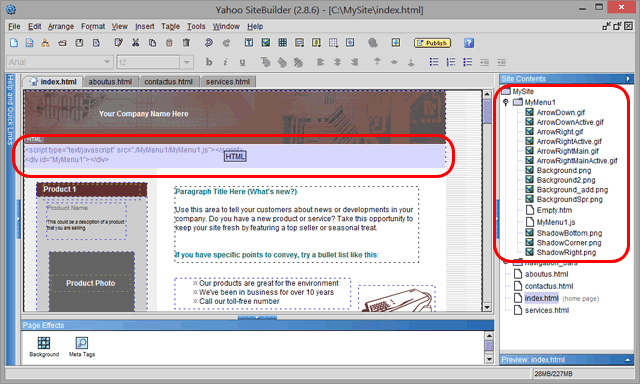 In Yahoo SiteBuilder, choose from the menu: Insert -> Code Elements -> HTML. Copy and paste the code below into the "HTML Code" dialog. Next, click the "OK" button; a blue box will be added to the page. This box is your menu. Finally, drag the box to where you want the menu to display, and set the width of the box equal to the width of your site (to show the menu without scroll bars). That's All! Now you can preview the page in your browser to see the drop-down menu on your page [*]. [*] In some cases the Firefox browser does not show icons in local preview mode. It is because the Firefox comes with a very strict "file uri origin" policy and blocks icon files referenced by "file:///". When publishing the website to your production web server, you need to upload the contents of the "MyMenu1" folder manually. Please take also into account that a single menu instance can be used for multiple pages of your site. Since a menu is a single folder (the "MyMenu1" in our tutorial), it is enough to replace (re-upload) the current folder with a new one to see an updated menu immediately on every page. It is very convenient because you do not need to edit the code on multiple pages. I hope this short post will help any website owner to create a professional multi-level drop-down menu for his site. Please do not hesitate to ask questions, we love responding!